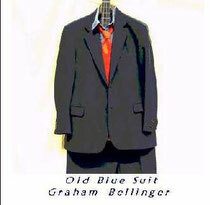 Old Blue Suit Sleeve Notes - grahambellinger's JimdoPage! This is a collection of songs recorded live on the back porch (or in the conservatory anyway) one day in early 2003. I recorded them because I enjoy them and love to sing and play them. For the guitar workshop guys amongst us I’ve added one or two notes about the playing of them……but the best advice I can give is - go and listen to the people who originally made them. I Ain’t Got No Home by Woody Guthrie – so understated yet so powerful. Drop the bottom E to D and a little in the style of Joseph Spence. Hard Time Killing Floor Blues is a bleak song from Skip James who sang in an eerie falsetto and played in E minor tuning. You should hear him. I tune the guitar DADGBD and don’t try for the high notes. By the way don’t reach for your phone at the end – I said it was recorded live! Brownsville Blues. Words from Sleepy John Estes - rather than Led Zeppelin - tune from Muddy Waters. Guitar is tuned to open G – DGDGBD. The Midnight Special. A folk club favourite many years ago, though turning it into a sing-along song rather lost the anger in Leadbelly’s words. I like to make it a little country sounding myself. In G.
Ragtime Millionaire by William Moore - the singing barber from Tappahannock, Virginia - is just too much fun for one man to enjoy alone. Hence I got slightly carried away on the bass strings. The Welsh guitar genius John James is responsible for the shape of this version. It’s in A with the capo at the second fret. The D7 at the start is a C7 shape slid up two frets. Most of these songs were originally recorded in the 1920s and 30s in the rural South of the USA. I must admit that for me part of the pleasure in the original recordings is in listening to the voices of people whose lives and times are so different to mine, yet they can still speak for me so clearly. What’s more their music put down so many markers for so much music which has followed them. Even though some of their recordings are challenging, if you seek them out and listen to them they will repay you with some insight into their world and ours.